Lenovo has discontinued its IdeaPad Z series multimedia laptops. Instead, they now focus on their IdeaPad 700 series laptops for those wanting a large 17-inch display which is both thinner and lighter than the older Z series. For other options, be sure to check out our picks for the Best 17-inch and Larger Laptops. 16.3" x 10.6" x 1.24" @ 6.4 lbs. 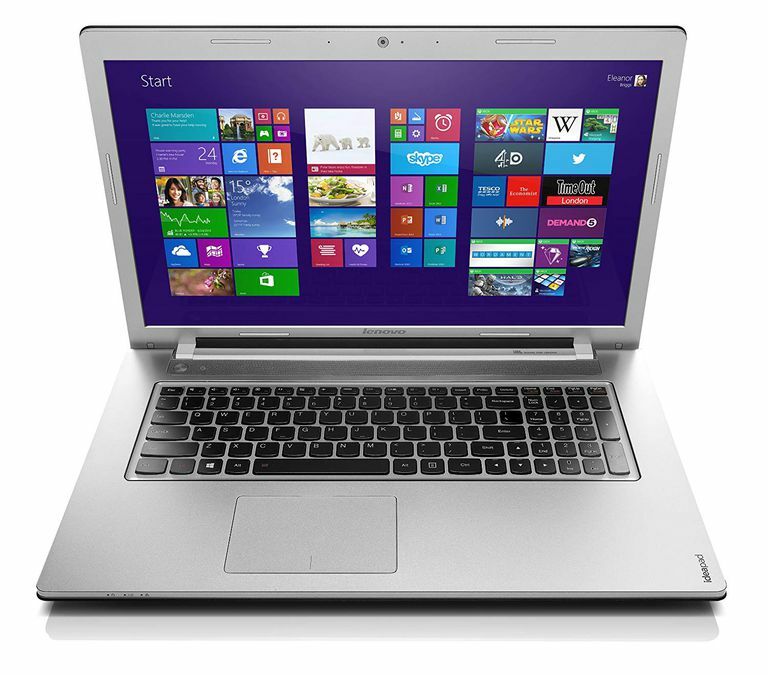 The Lenovo IdeaPad Z series is designed as a low-cost entertainment laptop. Since cost is a fairly important aspect of the system, the majority of it is constructed of plastic. This is a silver gray color for the bezel and keyboard deck but the bottom is all black. There is a bit of metal with a brushed texture to give is a bit more premium feel on the back of the display. It does have a bit more flex than some of Lenovo's other laptops but it still feels sturdy enough for most users. At least there is one benefit of the laptop being relatively light for a 17-inch chassis, as it weighs under six and a half pounds. Powering the high-end Lenovo IdeaPad Z710 is the Intel Core i7-4700MQ quad core processor. This provides it with a solid level of performance, such that it is suitable for very demanding tasks like desktop video work. The processor is matched up with 8GB of DDR3 memory that provides a smooth overall experience with Windows. Pretty much every version of the IdeaPad Z710 uses the same storage configuration. Lenovo elected to use a solid state hybrid drive. This combines a large one terabyte traditional hard drive with 8GB of solid state memory that is used to cache frequently accessed data. This does help boost some task such as booting up Windows, but the cache is relatively small, so it does not offer the same performance as a dedicated solid state drive but it does offer a lot more storage. If you do want to expand the storage, there are two USB 3.0 ports on the left-hand side of the laptop for use with high-speed external drives. The system still does feature a dual-layer DVD burner for playback and recording of CD or DVD media. Probably the most disappointing aspect of the IdeaPad Z710 is the display. While some models have a 1080p capable display, the majority of them including the model we looked at feature a very low 1366x768 native resolution. For such a large display, this is a very limited resolution that frankly is unacceptable unless it is an entry-level priced system. The color and brightness are decent but it is overshadowed by the large pixels. It is highly recommended that you look at a higher resolution model, otherwise, you might as well buy a smaller system that is more portable. As for the graphics, they are driven by the Intel HD Graphics 4600 that are built into the Core i7 processor. This puts it behind just about every 17-inch laptop in its price range. It is perfectly fine unless you are looking to do PC gaming, where it only has enough performance for low detail and resolution levels. At least it has the ability to accelerate media encoding with Quick Sync capable applications. Lenovo uses their now standard isolated keyboard design with the IdeaPad Z710. The keys themselves have a nice overall feel and responsiveness that makes it quite accurate when typical. Comfort could be improved slightly if they used the concave keys like their ThinkPad lineup. There is a bit more flex in the keyboard deck compared to some of their other systems. Overall, it is a decent keyboard but not quite up to Lenovo's previous standards. The trackpad is a decent size and features a full surface button that works as a left click. There is a space in the lower right to function as a right click but one does need to be aware when they press down. Multitouch gestures are supported well but be sure to check the software setup if one is not working as they can be enabled and disabled individually. With such a large laptop, the Lenovo IdeaPad Z710 comes with a surprisingly small battery, which partially explains why the laptop is so light. It features a very low 41 WHr capacity that is much smaller than the typical 17-inch laptop. In digital video playback testing, the laptop was only able to run for under three hours. This places it well behind most of the other general purpose 17-inch laptops on the market. It certainly falls well behind the Dell Inspiron 17 Touch that runs for over twice as long in the same test thanks to its more power conservative components and a larger battery pack. Pricing for the Lenovo IdeaPad Z710 is lower than most other laptops at just $1000 with many models priced lower than this but with lesser processors. The two closest competitors for the Lenovo would be the Acer Aspire V3 772G and the Dell Inspiron 17 Touch. Both do cost more but also feature 1920x1080 resolution displays with the Dell also having a touchscreen. The Acer Aspire offers a bit higher performance thanks to the solid state primary drive and an NVIDIA GeForce GTX 760M graphics. It has a similar short battery life but it is still longer, but the trackpad has some big issues. The Dell system as mentioned before offers less performance with a dual core i7-4500U that is much more power efficient for longer running times. It also features an NVIDIA GeForce GT 750M graphics processor. The screen is a bit on the dim side and has reflection problems from the glossy touch surface. Lenovo's IdeaPad Z710 seems like an affordable option for those that want a 17-inch laptop but it makes a few too many compromises. Sure, it offers a good level of general performance thanks to the i7 processor and it is a nice keyboard for those that have to type frequently but the display, battery life, and graphics all limit the potential of the system. The display is most notable as just about every 17-inch laptop at this price point offers a full 1080p display.